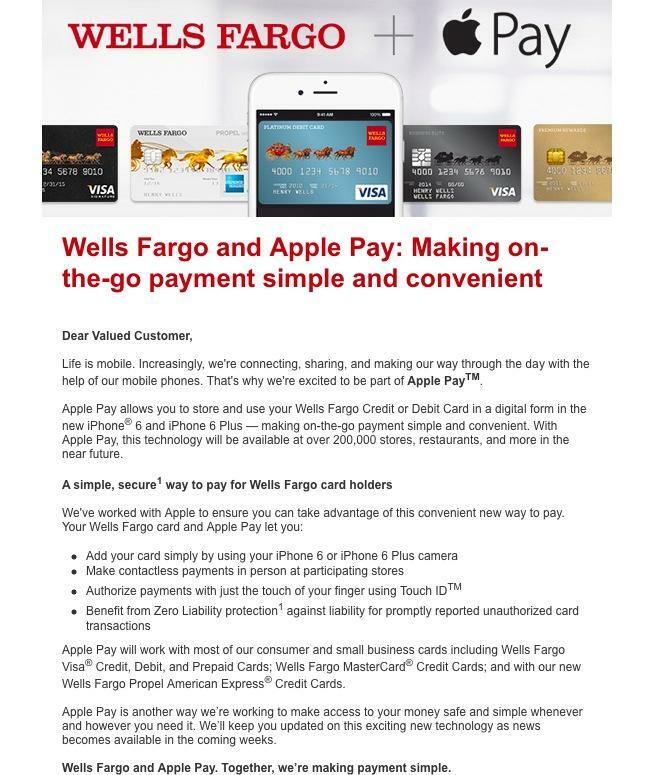 Following up on a press release issued alongside the initial introduction of Apple Pay, Citibank and Wells Fargo have both started emailing customers with a "coming soon" introduction to the new mobile payment feature associated with iPhone 6. Citibank notes that 200,000 stores "and counting" will offer "quick and easy payments" via Apple Pay using customer's existing credit or debit card accounts, with no need to apply for a special account. 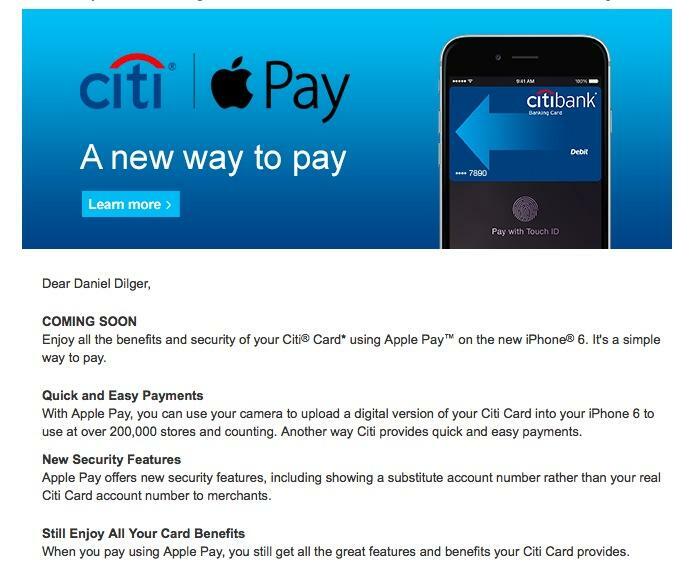 The bank also states that when using Apple Pay, "you still get all the great features your Citi Card provides." Citibank says it has "200 million customer accounts" globally, although Apple Pay will initially only work on its "Citi-branded consumer credit and debit cards (except for ATM and Chairman cards) issued in the continental U.S. and Hawaii." Apple's chief executive Tim Cook noted in his recent interview with Charlie Rose that Apple chose to work with existing banks and card processing networks because customers were generally happy with their existing accounts and wanted to retain their existing programs, including airline mileage plans and other cardholder features that banks currently offer. Citibank was announced as an early Apple Pay partner along with other top US banks including American Express, Bank of America, Capital One, Chase and Wells Fargo, as well as credit card networks Visa and MasterCard. Apple expects to activate U.S. point of sale Apple Pay transactions in October, with an additional set of banks slated to join afterward, including Barclay, Navy Federal Credit Union, PNC, USAA and US Bank. 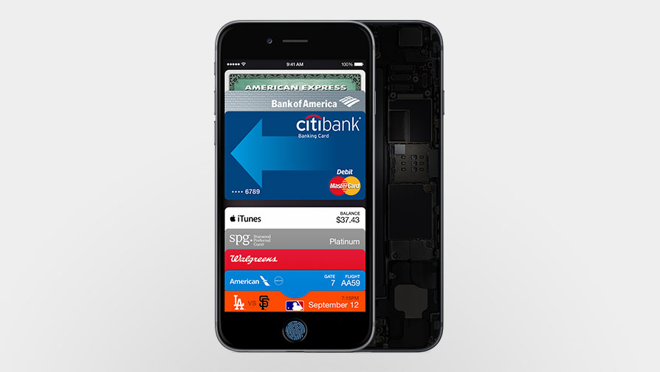 The new iPhone 6 will allow users to replace the conventional practice of credit card swiping with an electronic transaction that generates a "token" for each purchase, which Citibank described as "a substitute account number rather than your real Citi Card account number." Apple Pay's single use token expires with each use, preventing the card holder from worrying about his or her card being skimmed and cloned for unauthorized purchases, or having credit card numbers leak in a retail store exploit, resulting in an identify theft problem. If a user's phone is stolen, the electronic Apple Pay representation of their accounts can't be activated without a Touch ID fingerprint, so there's no need to cancel one's accounts or obtain a new account number. Putting a device in "Lost Mode" will also block any attempts at Apple Pay purchases from the device. Apple Pay users will be able to transfer their default iTunes credit card into the system just by suppling the card security code, and can input additional cards using the iPhone 6 camera. The entered cards appear in Passbook and the user can select between them before making a purchase, or simply use their default card by activating Touch ID while pointing the phone at a payment terminal. Google pioneered NFC payments on Android three years ago, but used a different credit card model that essentially made Google a card issuer for a specific "Wallet Card" MasterCard account that needed to be credited with money (like a PayPal account), or could pass through charges to another account. That allowed Google to collect data on users, but put it at odds with banks because Google was now a competitor. Users also needed to set up a new account, rather than using the cards they already have and use, eliminating the benefits of miles, cash back or other loyalty programs. Despite spending lots of money deploying Google's Wallet payment terminals, Wallet never became popular because it didn't solve any real problems while injecting new problems and complications. Google's terminals will however continue to work for Apple Pay users, using their own, existing accounts. Android's wide open access to NFC hardware, which included "Android Beam" file transfers similar to (but not compatible with) Apple's Bluetooth-based AirDrop, and the QR-code like ability to launch any arbitrary webpage URL from a static RFID tag opened up serious security problems for Android users that do not exist on iPhone 6 because Apple isn't exposing the NFC reader to tasks outside of Apple Pay. Apple Pay has also caught the attention of PayPal, which launched an ad campaign questioning Apple's ability to secure payments. That message that was roundly criticized given PayPal's long history in poorly managed security, user-hostile policies and high transaction fees.